Brand new 1 Ounce 2018 Platinum Austrian Philhamonic Coin. 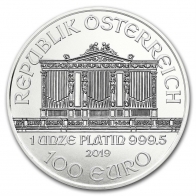 The Austrian Philharmonic platinum coin is the first in the series to be produced by the Austrian Philharmonic. The coin features the image of the Vienna Philharmonic on the front, with the size, fineness, year of the coin. Beneath this is the coin's face value of 100 Euros. The reverse of the coin features an image of a number of instruments used by the famous Vienna Philharmonic. The 1 Ounce Philharmonic coin is also available in gold and silver. 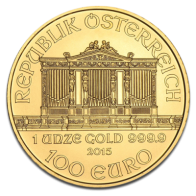 The Austrian Philharmonic series of coins are very popular among precious metals investors in Europe. The platinum Philharmonic was introduced to the market in 2016. 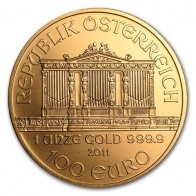 The Austrian Mint, which produces the Philharmonic gold, platinum and silver coin, also produce a series of gold bars available to investors. 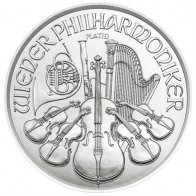 The 1 Oz Platinum Philharmonic coin is available from SwissBullion.ch for VAT-free Swiss storage or delivery.